In a recent article published in the Montreal Review of Books entitled “Can You Go Home Again?” Ami Sands Brodoff discusses H. Nigel Thomas’ newest book, No Safeguards, which she describes as “a dense, meditative book about the wounds of history filtered through memory”. Brodoff also sits down with the author to talk about Thomas’ background and inspiration. Brodoff begins by explaining some of the major plot points of the novel, stating, “in No Safeguards, Thomas grapples with the complex bonds and migrations of a Vincentian family, among those people often left out of conventional Canadian histories”. One of the first questions that Brodoff has for Thomas “is how closely the novel hews to his own history”. Thomas explains, “’it’s not autobiographical in any factual way,’…though he acknowledges parallels in the violence of the father and in the inspiration of a grandparent”. Thomas states that the major influence that drove him to pursue literature was his grandfather, who taught him how to read before he went to school. Thomas’ early love of literature motivated him to become an English teacher, which he achieved when he arrived in Montreal, ‘eager to experience life on a continental scale.’ After teaching English and French for a dozen years, he went on to earn his PhD and was appointed assistant professor of US Literature at Université Laval. Since 2006, he has devoted himself to writing full time”. Brodoff praises Thomas’ writing, stating that he “evokes landscapes with a painterly brush”. Brodoff also states, “Thomas’ strengths are voice and dialogue and he has a lively sense of humour”. One example that Brodoff gives in her review refers to the character Paul from No Safeguards, whose “speech, rap music, and poetry are seasoned with wit, poignancy, and power, as he incessantly needles and confronts his older brother. There is a priceless scene in a Montreal gay club when Paul says ‘Tonight you’ll give it up, Bro. Besides, let’s face it: brothers who sin together bond better’”. Brodoff concludes her article by discussing the novel’s portrayal of homophobia, which is a concern for the brothers Jay and Paul in No Safeguards. Jay and Paul are both gay, although they come from a region where there are “anti-homosexuality laws, gay people are tortured, imprisoned, and murdered”. Brodoff explains that these “concerns are rooted in Thomas’ own experience. He sees the themes of the novel as ‘the accommodations we must make to live in society, as well as the high cost of repression.’ In 1994, despite rampant homophobia in St. Vincent, Thomas came out publicly there. ‘This was the first time my family knew I was gay, the first time friends knew’”. 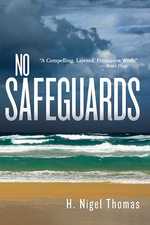 Tagged with Ami Sands Brodoff, H. Nigel Thomas, Montreal Review of Books, No Safeguards.